It’s a difficult concept for outsiders to grasp – Vietnamese people keep cats and dogs as pets, they love them and are loved in return. Yet cat restaurants and dog restaurants exist here. People don’t actually eat their own pets. Not unless the family is starving or the pet has done something wrong. In the West, a very naughty or dangerous cat or dog would be put down … and buried or incinerated. Here, it would be a shame to waste the meat! I don’t like the concept of eating dog at all. Dogs are loyal and loving and you can see the intelligence in their eyes — and the pain. The worst thing about dog restaurants in Vietnam is that the dogs are tortured before they’re slaughtered. It’s believed the surge of adrenaline through their bodies makes the meat more tender. The concept makes me a bit sick. I hate seeing “thit cay” (dog meat) signs. I hate it even more when I don’t look away fast enough and I see a roasted leg in the window. Thank goodness I’ve never seen the places where the whole roasted carcass is on display. Darling Man tells me people eat dog because it’s considered lucky, tasty and an aphrodisiac. 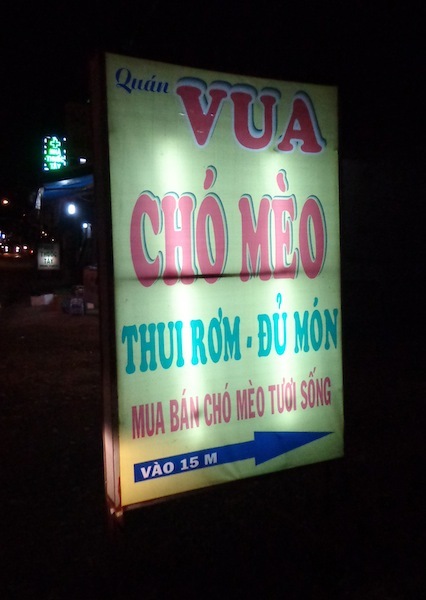 For a true dog meat experience, you’re supposed to go to a place that does “cay mon 9” or dog nine ways. Cat restaurants also baffle me. I mean … why would you eat a cat when there’s plenty of cheap and delicious seafood around? And chicken and pork. But Darling Man says cats are considered “little tigers” so eating them is supposed to give you the strength of a tiger. I don’t want to have anything to do with dog restaurants OR cat restaurants. Today, one of the street cats from behind our house squeezed through a partially opened window, came upstairs and murdered one of our birds. It was in its cage and the cat somehow killed it and hauled the frail little body – or bits of it – between the narrow bars of the cage. It happened at about 4am and the screaming of our blue bird’s “wife” woke me up. I ripped open the bedroom door, our dog rushed past me and barked once and a streak of darkness flashed between me and the dog and disappeared into the blackness of the stairs. I’m not the sharpest tool in the shed at 4am. Darling Man said my scream woke him up, but I don’t remember screaming. I wanted to see what happened but I couldn’t get the light to turn on. It was several long seconds before I realised the power was out. So by the light of our mobile phones Darling Man and I surveyed the damage. Three trembling budgies, still in their cage. Scattered feathers. A pitifully small pool of blood. Our dog, surely an embarrassment to her German Shepherd AND Pekinese heritage, leaned against my leg, seemingly happy to have escaped death herself. These f@#$king cats are just getting too much. This is the second bird they’ve killed. 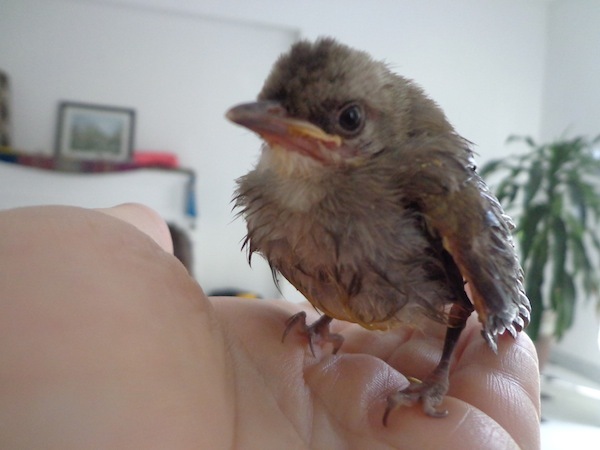 The first bird, creatively named Birdie, we found in the garden, a wobbly-necked frail newborn, still shaped like an egg. Darling Man brought it/her/him (we never worked it out) inside and made it a little bed in an ice cream container. He went out and bought a bag of crickets and some special bird food he mixed with water to make a strange smelling goop that we rolled into small worm-like shapes and dropped down Birdie’s gullet every couple of hours. 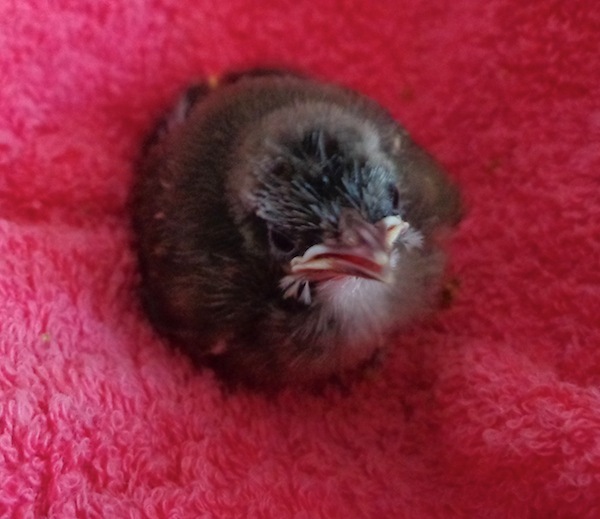 I didn’t think Birdie would make it so I tried not to get too attached. But she was a sweet thing. So gentle and trusting. After two weeks, Darling Man started teaching Birdie how to fly. He swooped her up and down on his finger so she fluttered her wings. After a couple of days of this, she suddenly flew from his finger to my shoulder. She made short flights around the lounge room, landing once of Miss M’s face and I was so proud of Miss M for just shutting her eyes and staying still rather than trying to bat the little bird away. Our dog was also gentle with Birdie. Gentle in a calm disinterested way, the same reaction she has to chickens and baby chicks. Birdie had just made her first Skype call to my relatives in Australia when one of the f#$@king street cats got her. It was the first anniversary of my Dad’s death, so the Skype call was a bit maudlin. I put Birdie on the call to try to cheer everyone up. Mum and my sister, of course, loved Birdie. And 10 minutes after the call ended I heard a crash in the lounge room. I ran in to find feathers everywhere and Birdie’s cage empty. It was very upsetting. Especially on a day when I was already sad. So a friend tried to cheer us up with a pair of budgerigars. One blue, one white. Darling Man, the softest man on the planet, went out to buy a cat-proof cage and came back with a cage WITH A BIRD IN IT. I told him budgies are happiest in pairs. So he went out and bought another one. And just like that we had four budgies. Had. Now we have only three. And I am carrying the cage around the house with me. Afraid to let it out of my sight. And I’m asking Darling Man if we can call up a cat restaurant to come and catch the nasty street cats that are monstering our household. I love animals and I hate thinking of them being hurt. But I don’t know how to resolve the problem of the cats without … er … terminating them. They are not fixed up and they are breeding rapidly. When we moved into the house five months ago, there were two adult cats and four kittens. Now there are six adult cats AND FOUR MORE KITTENS. Soon the young cats will be having litters of their own. And it’s all happening in a very small space — the three small courtyards belonging to us and our neighbours either side. On one side, our neighbour has built a cage over the courtyard. The cats loll around on top of it. Now it seems the feral street cats “own” our house. In Ho Chi Minh City’s sweltering heat, we seal up our house against the cats. We miss the cool breezes that our part of town has. When we leave a room, we lock it up tight. The nasty street cats that possess our back yard don’t come into the front courtyard or into the street. Other street cats “own” that territory. And the other street cats are much nicer. After a sad day today mourning Blue, as the sun set, I heard the surviving birds fluttering in their cage. One of the evil cats had come back, a speedy shadow that ran right past our dog and our helper and up the stairs to take another bird. I got there before anyone was hurt. And that’s when I started thinking, really thinking, about cat restaurants and dog restaurants. Are they the local form of animal control? This is a poor country, after all, where animal sterilisation would come way down someone’s priority list, after food, schooling and other human necessities. We, after all, haven’t gotten around to fixing up our dog. It’s on our list but we are both soft — and not very impressed with how local vet clinics look. Operations are conducted within sight of the waiting area, which is often wide open to the street. I remembered the two lovely street cats we adopted when we lived in Hell Money Hem, before we had Miss M. First one and then the other disappeared. Our neighbours said local boys probably caught them and sold them to a restaurant. I missed those cats. And our dog’s mother went missing from Darling Man’s parent’s house earlier this year. The family thinks the dog restaurant down the street took her. As an animal-lover, could I really condemn an animal to death? Today I could. And not all animals, just the nasty street cats that have taken over our house and murdered our pets. Near our house, there’s a sign for a cat and dog restaurant. I usually look away but tonight when we drove past I asked Darling Man to stop and help me translate it. The sign says: The King of Cat and Dog Restaurants. Straw barbecue – many types of dishes. We buy “fresh” dogs and cats. 15 metres that way. I’m so sorry about your birdie! What a sweet little creature. That’s a terrible dilemma you’re in. A nasty mean mutt attacked my beloved pup once and I – an avowed animal lover, and(now former) vegetarian of many years who would never harm an animal – kicked the sh*t out of the beast to get him away from my dog (who ended up spending Christmas in he animal hospital). I would have inflicted any damage necessary to get him off of my little dog so I totally understand. On the other hand, it’s so sad to think of killing an animal that doesn’t know any better. I don’t have an answer, but I feel your pain. Hey Dana, rescuing your dog from a dog fight isn’t so mean. Don’t beat yourself up about that! After sleeping on it, I don’t think I could kill our horrible street cats. I think we will investigate building a cage over our back courtyard to keep them out. Well… This is life! You know, like: eat and be eaten? For the cats and the birds, that is how life should be. Cats catch birds and mice, thats what nature has programmed them to do. Our own cat (yes, now I am outing myself ;-)), although well fed and quite cozy in our flat, nevertheless can’t help but catch any unsuspecting bird that flutters around our balcony. I am terribly sorry for those little guys, but I can’t blame my cat for that. She is a cat! Those street cats of yours do not hate you or want to destroy your loved ones, you know that, don’t you? They are animals, they do not plan or think or act maliciously. I do not know if anyone feeds them – probably not, I guess. What are they supposed to do? Only catch unowned birds? Only catch birds that are harder to get than yours, nicely presented in cages with bars wide enough to get a paw through? Live in celibacy because they foresee the rising cat population pressure in your confined little yard ecosystem? Not even humans do that, if there is no government who forces them. You have so many options – feeding the cats, having them sterilized, train your dog to watch out at night, do not keep birds in your house or buy them a safer cage with tighter bars… Yes, that may be a bit more challenging than just calling someone to catch and butcher them. You can do that, and in Vietnam it is even socially accepted. But if you do that, please don’t tell us how you hate those restaurants. To go on about that, BUT having second thoughts about it as soon as you are personally involved, makes me sad. And after having said all that: I am really sorry for your dead birds, I am. Hey Jenny, I know what the cats are doing is part of their nature. I tried offering some food to the boldest little cat, the one who would sleep on our back step, in the hope that we could adopt it. But it is truly feral. I have to admit I never really thought about sterilising the cats. But it really doesn’t seem feasible to catch 10 wild cats, pay to have them sterilised, then release them back into our back yard where they’re not wanted. I am just sad at losing our pets and frustrated about the situation. I must not have expressed that properly — I wrote this post late at night while still pretty angry. Ahh, but if you sterilize 10 cats, that is 10 cats less that can reproduce or help to reproduce! 😉 we call that TNR (Trap, Neuter! Release). As unfortunate as it is, and as others have expressed, it is the nature of the cat to hunt out birds especially feral cats. And like any predator, they go after the vulnerable – they dont have to work for their meal when the birds are sitting ducks. The feral cats are most likely not being cared for and they too fall victim to being hunted themselves. I have had two outdoor cats killed by neighborhood dogs & strays. It is a tough life for unwanted animals. Very sad indeed. Well, Marie, our feral cat problem seems to have vanished, which make me think that the local cat restaurants are an informal form of animal control. We have decided to be a no-bird family now because we can’t guarantee their safety. I prefer to see birds in the trees, anyway. It was just circumstances that saw us owning birds in cages. Aww Birdie was adorable. I’m so sorry about Birdie and your other budgie. What nasty cats. Tough call. I honestly don’t know what I would do other than go buy fly screens and grills! Tracy recently posted..What bags do we travel with? In Australia, I don’t think I would even think too much about it. It’s expected that feral cats need to be taken away, so you call the RSPCA and get them taken away. I don’t believe in the death penalty. I don’t think I can do it. I do like a lot of Jenny’s solutions though. As she says, the cats are just doing what hungry cats will do. What about leaving food out for the cats and rewarding your dog for barking at them? A larger bird cage with more secure doors and wires that are closer together. Bigger cage with more room for the birds to get away from any cats and enough for a branch in the middle so the birds can hide. A hook from the ceiling for the bird cage that you hang it on in the middle of the night or when you are not in the house that cats can not get too. There must be other options to try. Look for plants and smells that repell cats and leave them near your windows. There has to be some Vietnamese herb or ointment that cats hate that you could smear all over the window sill .. that hopefully wouldn’t attract hoards of ants of course! Maybe you could start drying hot peppers from your windows! Maybe we borrow our dog’s boisterous offspring to scare the cats away. The problem is … I don’t want to be stuck with two dogs. And my parents-in-law have made a few comments suggesting Noir is a bit much for them. Which leads me to the other dilemma. Any pet we have in Vietnam can never come to Australia with us because of the quarantine rules. 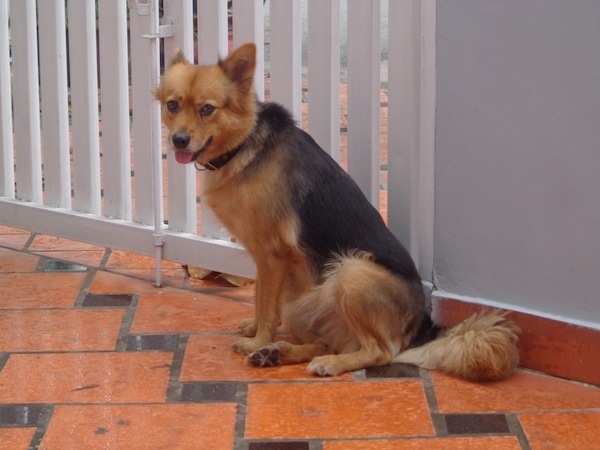 We are very aware of that… and before we acquire a pet we have to check with Darling Man’s relatives whether they will look after them for us when/if we leave Vietnam. Luckily, the whole family is as soft and animal-loving as Darling Man! I vote for the cat restaurant. I’m assuming there’s no animal control to call. In Australia they would definitely be collected up and put down. The RSPCA doesn’t even try to rehome feral cats. They just put them down as far as I’m aware. I think changing your mind is definitely allowed once you’ve been at their mercy. If you feed them, they’ll just have more kittens. What if Miss M was a baby and they were having a sleep in her bed? F%#* it! Sell them and make some cash! I know. I’m a bad person…….so be it….! Tracey – Life Changing Year recently posted..Should You Choose a Hostel or a Hotel When Budget Travelling? You are a toughie, Tracey! I don’t think the cat restaurant would pay US$1 for a cat. We certainly wouldn’t do it for the money! I normally enjoy your posts but this once is extremely simpleminded. How can you get angry at nature? Cats have to eat too. Should they just eat garbage instead to make you happy. Should we condemn you daughter to death because she eats pigs, cows or chickens. All animals are another’s child but obviously its only criminal when its your pets. If you should get angry at anyone, it should be yourself. Get a better cage and put water around it, install screens. If the buddhist belief of reincarnation holds true, you may come back as a feral cat. I’m sure they’re lives are much harder than yours but I guess its hard to empathise with an animal fighting to survive when your biggest concern is missing out on a cool breeze. My biggest concern isn’t missing out on a cool breeze, Bristol! I am not angry at nature, I am upset that our pets keep getting killed. It’s not really natural to have six to 10 wild cats in a very small space in suburbia, anyway… in any country. I don’t really think I can kill the cats. I am just upset and frustrated and going through the options, which are very different here than at home. I think we have to build ourselves a cage to protect us from the cats. Tell me — what would you do in this situation? Wow. Loving the intensity of the comments on this post, Barbara! Let’s get something straight. I’m an animal lover. I’ve had pets all my life. Still do. But I’m going to take an unpopular stance here… Relocate them (ie. to a pagoda somewhere) or humanely have them killed. It’s one thing to follow a “live and let live” policy and quite another when wild cats are INVADING your house, entering at will and killing things you love. You took on the responsibility of taking care of those birds, you did NOT take on any responsibility towards the cats. And the suggestions to cat-proof your bird cages are ridiculous. Where does it end? Cat-proof your cupboards? Food? Goldfish? A more sensible approach would be to cat-proof your house. You have no idea what kind of microbes those cats could be bringing in. What if they were to nibble on something in your kitchen without you noticing, only for you to eat the same food later? But the question is: to what extent should you suffer (ie. not being able to open windows and doors)? In this case, the feral cats are no different than feral rats. I wonder if some of the other commenters would put up so graciously with letting rats run around their house? If all else fails, let Darling Man do it. We Vietnamese are practical, without being saddled by the anthropomorphic guilt of Western culture (and isn’t this what travel is about? Not trying to impose your culture onto others?). “Little tiger” steaks, coming up! Relocate them to a pagoda? Now THAT’S an option I was unaware of. I like that, James. And by the way, Darling Man says he couldn’t actually send the cats to the cat restaurant, where they are bonked on the head with a hammer. We have tried to cat proof our house as much as possble. Lids on all saucepans on the stove when things are not actually cooking, a giant tent-like thing to cover the kitchen table, doors and windows closed. I don’t even know if cats are native to Vietnam. I know there are a few tigers left in the jungles … the lucky ones who haven’t been caught to make “medicine” or tiger wine. How are they getting INTO your house? You’ll have to check on whether the pagoda thing is done here in Vietnam. I know it was quite a common thing to do in Cambodia – leave unwanted animals at a the pagoda instead of killing them (which for devout Buddhists would be a no-no). Bad news, James. Darling Man says pagodas don’t take unwanted animals in Vietnam. And it sounded like the perfect solution, really. We still don’t know what the answer is either. The problem will not be solved if you have the cats killed – that should be obvious. There will be other cats happy to take over the vacant territory, they will breed too, they will eat too, and you will have to kill them too. Now, you can kill nasty things like unwanted cats on a regular basis, no problem, and some people are obviosly quite enthusiastic about that simple solution. But as far as I have come to know you from your posts, that is not what you want to do or to be – is it? I remember once sitting at my computer after my budgie had gone back in his cage. I had opened the doors to let fresh air in. We live on the first floor so never even thought that some other animal could come in. By pure luck, I happened to turn my head and there was a cat making its way very sneekily towards my budgie. The rage that I felt towards that cat really scared me. What scared me even more was the hurt that I would have felt if the cat had made it to the bird cage. I screamed at the cat and chased it out onto the balcony. It ended up cornered and chose to jump from the first floor balcony to get away from me. I remember being so angry that at that time, I could have done anything to that cat. However now looking back on it, I understand it to be the food chain. It is the natural instinct of a cat to chase birds and according to the cat, it was not doing anything wrong. What upset more is that no one understood my rage. They just kept saying it is only a bird. You can get another one. However I am sure you will understand me when I say that budgies are so sensitive towards their owners. They feel and sense us as well as rely on us. A special bond can be formed between a bird and its owner, I think more intimate then owning a cat. It’s part of our innate parenting instinct, I think, Natalie, to have that fierce urge to protect the things we nurture. And when you can’t protect your precious little things, the feeling is just awful. I agree that if you get rid of these cats more will come. A security grille over the courtyard would be an idea. If fly screening materials are available in Vietnam you could just do the room the birds are in. The Vietnamese are very inventive – if you show them what you want I am sure they could whip up a flyscreen for a door and a window. If they don’t have the flyscreen mesh get it sent over from Aus. I could not close the doors and windows in Saigon’s climate! There’s certainly plenty of other cats around to take over the territory, Jan! We’ve been studying our back courtyard carefully, trying to work out what kind of anti-cat devices we could rig up. I don’t really want to feel like we are living in a cage, though! Quite the conundrum. I say those cats have earned whatever they get. Do you mean the cats have earned the right to eat our birds, Stephanie? Or that they deserve whatever sentence Darling Man and I hand down? Sorry to hear about your birds. In Africa / India sometimes people rub extremely hot chili peppers on fences to keep out elephants. Might chilies ward off cats somehow if you can rub them on places where the cats are crossing the fence? I don’t really know, but maybe there’s a way to make them uninterested in entering your compound like that? Mark Wiens recently posted..Get it NOW: eBook: 101 Things To Do In Bangkok! I guess we’re just lucky it’s cats that are the problem, not elephants! I would feel conflicted too. I nearly cried reading about Birdie. Beautifully written story. I remember seeing a cage on the back of a scooter on the way to HMC absolutely cramed full of dogs. Interesting post. I was especially horrified to learn that they torture the dogs and cats before slaughter…. The thought is truly terrifying. My boyfriend and I just spent 2 months in China and in yanghsuo I took a cooking class where they led us through a market where for the first time I did see whole dog carcassas hanging from hooks, with live dogs and cats in cages and even witness a vendor pulling 3 dead cats out of a boiling vat of water. Really just gives me the chills. On the other hand yes I do wonder if this is a form of animal control here, especially with spaying/neutring animals probably at the bottom of the priority list. I really am sorry to hear about your birds – so sad! I know I will definitely be staying away from the cat and dog restaurants. Just the other day in Hanoi we were hanging out with a local guy (we met through Couchsurfing.org) and he was telling us that his dad owns a dog restaurant and offered to take us there for a meal. but we politely declined. Can’t imagine eating dogs or cats for dinner, especially when there are plenty of other meat or vegetarian options. He did a very good ‘endoscopic’ neuter for our dog as it didnt require any time for recovery and he was well cared for! We also had Dr Nghia pet-sit him as we travelled, and he got to live with Dr Nghia’s cats which went well! In regards to keeping cats out, this may sound nasty but are there any quick and less painful poisoning options? Also, in Perth we would sometimes use lines of low voltage electric fence to border off areas. Hey Laura, we know Dr Nghia, he is just lovely. I’ve just posted an update on our cat dilemma. Things turned out far less gruesome that I expected. You can read it here. As much as Darling Man would love to wire up our back fence, I think the neighbours might object. And it could hurt the wild birds that flit around. But still … GREAT IDEA! We travel with our Jack Russell Terrier, a steely hunter who LIVES to chase things. Hopefully we’ll make it to Vietnam next year, and when we do, Archie will take care of your cat problem in about three minutes. Then we’ll all go hit the Pho Trail. Deal? Love the blog. This is my first visit. Yay, Archie! Maybe he can show our dog how to chase things *with feeling*. We’d love to take you out to eat pho. Are you really coming to Vietnam?